This story started in winter 2004, when on January 28 in its Moscow Gallery, located next to the Central Post Office on Tverskaya street, Samsung announced the launch of the first in company's history mobile hard disks (hard disks of the 2.5-inch form factor) – SpinPoint M series. For the Korean giant this move was another stage on the way to the cherished goal – to become one of the largest hard disk manufacturers in the world in the nearest years. For this goal Samsung firstly "updated" its range of desktop hard disks (of the 3.5-inch form factor with Serial ATA and UltraATA interfaces) to a world level, making it very similar to the imposing product range of one of the leaders (parallels between Maxtor are obvious). 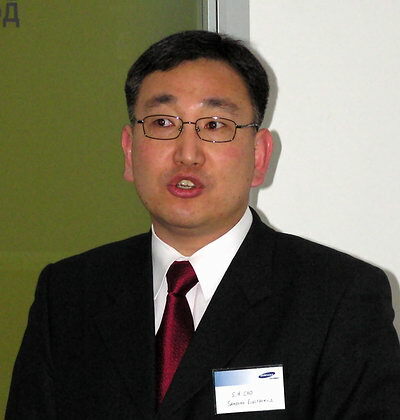 According to Seok Hee Cho, head of the information systems department in Samsung (on the photo), while five years ago Samsung hard disks faired as products of relatively mediocre quality and performance among retailers and customers – not bad but not the best either, these days they are already competing on the par with the leaders in this sector. Which on the whole is confirmed by tests carried out in independent laboratories. The reliability of these hard disks has been on a high level last years (three-year warranty for all models). Moreover, Samsung did not limit itself to simple copying the leaders of hard disk manufacturing, but introduced progressive proprietary technologies as well – for example, the so called "Elastic Writing Density". By their acoustic quality in operating conditions Samsung desktop hard disks are ones of the quietest. So, gone are the times when Samsung desktop hard disks were positioned for "low end PCs". The main directive for customers shifts from the "quality" criterion to the "performance plus quality" criterion and the range of models is focused on the highest performance and promising solutions. As a result, in less than a year the share of Samsung hard disks, for example, on the Russian market rose from 5% to 23%! where Samsung has its own huge business, and many competitors have already directed their eyes to this market – a year ago, after a long pause, Seagate successfully got back to manufacturing 2.5-inch hard disks (Momentus and Savvio series), and Maxtor and Western Digital are at the completion phase of designing their own mobile hard disks. The first series of Samsung mobile hard disks, which entered the market in the middle of this year, is codenamed Magma, being officially called SpinPoint M40. 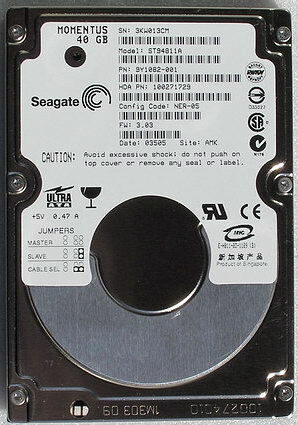 The spindle rotation speed in the hard disks of this series is 5400rpm (the company will not manufacture 4200rpm hard disks at all), 30, 40, 60 and 80 Gb (all the models are built with the 40GB per platter disk technology; hence the figure in the name), 8 Mb buffer, average seek times are 12 and 14 ms for reading and writing respectively, and the UltraATA /100 or SerialATA interface (the latter models are called Magma-S). On the whole, they resemble Seagate Momentus storage devices, which were launched about a year ago. Shock resistance of SpinPoint M is about 250g in operation mode and up to 900g when not connected to power – it's even a little better than the average values demonstrated by competitors, because the SpinPoint M series was designed with increased reliability in mind – mechanical platform and solid housing are designed to minimize exposure effects to the most important parts of the storage device. Plus a low level of acoustic noise – 22-24 dBA in idle mode and 24-26 dBA in seek mode (it's also a tad better than in major competitors). 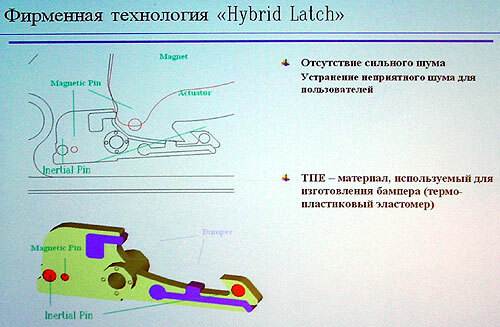 The new progressive Hybrid Latch technology (see the slide) developed by the company engineers eliminates not only the traditional disagreeable idle noise, but also considerably reduces crackling noises in seek mode (depending on the selected operating mode). All SpinPoint M devices use fluid dynamic bearing motors. Operating temperature range – standard from +5 to +55 degrees centigrade. 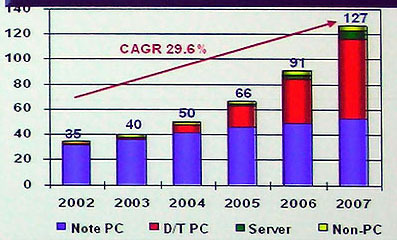 The claimed nominal power consumption is also a tad better than in competitors. Main characteristics of the SpinPoint M hard disks in comparison with those of some competitors are given in the table below. Table 1. Main characteristics of Samsung SpinPoint M hard disks in comparison with their competitors from Seagate and Hitachi with 5400rpm rotational speed and 40GB per platter disk technology. I also want to note that Samsung has two R&D laboratories for mobile and desktop hard disks – in San-Jose (California, founded in 1990) and in Suwong (South Korea, started research in 2000). All Samsung hard disks are manufactured on a plant in Gumi, Korea – it was opened in 1996, and now it has 5 fully automated and 7 semi-automated process lines, clean room class 10, and it already manufactures about 15 million devices a year. Note that Magma hard disks are delivered not only to notebook integrators, but also to retail distributors in OEM packages (when this article was written, the average retail price for a 40GB model was 85-90 USD), though retail versions of these drives are not planned so far. Four models of mobile hard disks took part in these tests. Firstly, it's a hero of today's review represented by a 40GB model – Samsung SpinPoint M MP0402H. 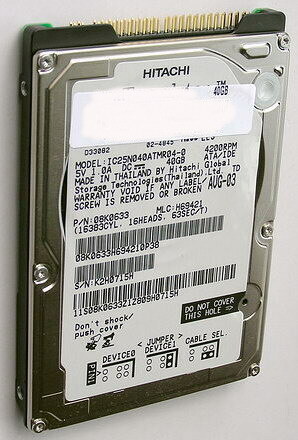 Some information on this hard disk is provided on the screenshot from Hitachi Feature Tool. Secondly, it's certainly the first up-to-date mobile hard disk from Seagate – Momentus ST94811A, which was already reviewed before. Here we used the top 40GB Momentus model with 8MB buffer – the exact match to Samsung MP0402H. The third company, represented in this review of mobile hard disks, is of course Hitachi Global Storage Technologies, the heir to the inventor of hard disks – IBM. HGST competitor to 5400rpm Samsung and Seagate hard disks will be a device of the same generation – Travelstar 5K80 series – 5400rpm HTS 548080M9AT00 with 8MB buffer and 40GB platters, but with the 80GB capacity. We haven't reviewed this model yet. All the more interesting to see it in practice. The second HGST representative in this review is a hard disk that had been still designed by IBM – famous Travelstar 80GN, 4200rpm IC25N040ATMR04 model with 2MB buffer and 40GB capacity. Though it belongs to the previous (last year) generation, it also uses 40GB platters and these hard disks are still installed in some new notebooks (to say nothing of players and portable storage devices). And it will be interesting for us to see how far the 5400rpm models manufactured this year have gone from good 4200rpm models with smaller cache size that were manufactured last year. At first glance, the desktop testbed instead of a mobile testbed may seem unjustified, but this is not true. Firstly, this testbed is more flexible than a notebook, it's more reliable (even notebooks based on Intel Centrino sometimes have bugs, which may have negative impact on the objectivity of our tests). Secondly, this desktop platform is not so far from some mobile ones in its essence – notebooks based on Pentium 4 Northwood are very popular these days, dual channel memory controller will soon appear in the mobile platform from Intel (Alviso chipset) as well, and the UltraATA disk controller in the ICH5 hub is actually the same as in mobile ICH4M (for the only exception of power saving options). Moreover, a common testbed allows correct comparisons of the results obtained for mobile and desktop hard disks. And in future, when mobile hard disks will switch to the SerialATA interface on mass scale – it will allow simple continuity and comparability of new results with the old ones. Thus, without principal hardware differences (the same processor, memory, hub-link, and disk controller) this desktop testbed can provide more flexibility and objectivity in testing mobile hard disks than some notebook. 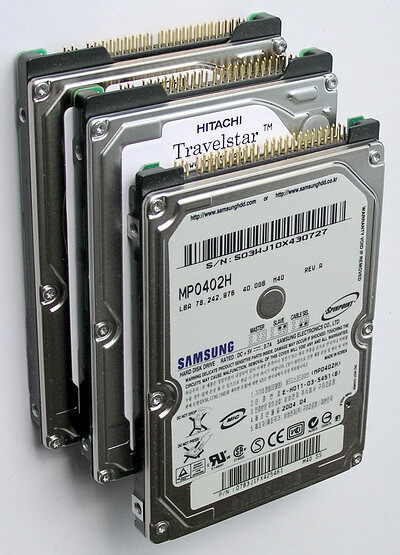 To say nothing of the tendency to use 2.5-inch hard disks in space savers and slip servers, which has been actively developing recently (and these computers often use Pentium 4 processors on i875/865 chipsets). The mobile hard disks were fixed to the metal chassis of the PC case and connected to the UltraATA/100 controller on the ICH5 bridge of the mainboard via an adapter. The main hard disk was installed as master on the first channel of the chipset controller, and a hard disk to be tested was installed as master on the second channel of the same controller. All the hard disks tested in this review had no problems with overheating and deterioration of characteristics at least during the three days of intensive testing. No additional cooling (special coolers and fans) was provided for the hard disks. 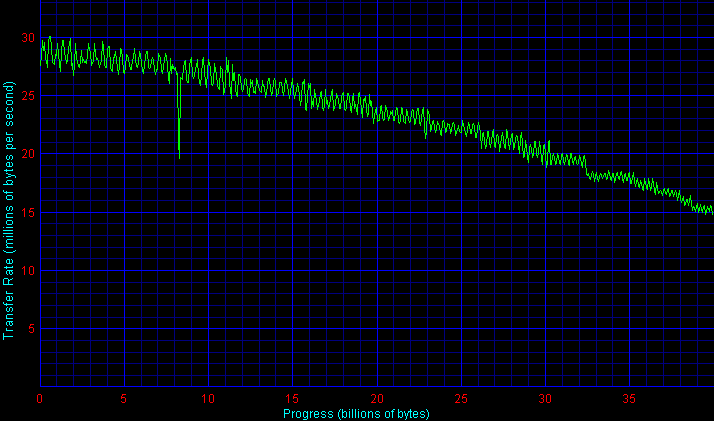 Before the tests, we warmed the hard disks for 30 minutes using a utility with active random access. The tests were carried out under MS Windows XP Professional SP1. The hard disks were tested not partitioned (in Intel Iometer, H2Benchw and AIDA32 tests) as well as partitioned and formatted by regular operating system tools depending on a test type: one NTFS partition of maximum size for testing the average access time and plotting the read speed graph in WinBench 99 and two NTFS or FAT32 partitions of the same size for other tests (WinBench Disk WinMark 99, copying files with various patterns, ATTO Disk Benchmark test, multithreaded read/write Nbench 2.4 test and the hard disk speed test in Adobe Photoshop). Each NTFS partition occupied half of the entire disk capacity (that is the second partition started exactly from the second half of the disk). FAT32 partitions were 32768 MB, the first one starting at the outer edge of the media (on the "fastest" tracks), and the second – exactly from the second half of the media. NTFS and FAT32 cluster sizes were selected by default – 4 and 16 KB correspondingly. To detect physical characteristics of the hard disks (average access time, interface speed, and linear read/write speed of the platters) we switched to AIDA 32, H2benchw and WinBench 99 and almost completely dismissed the popular HD Tach test. To evaluate the overall performance, we use multiple patterns in Intel Iometer, essentially reworked multiparameter test for copying files, fairly good C'T H2Benchw test, Adobe Photoshop disk operation, multithreaded reading and writing files, and the universally recognized WinBench 99 (though we are not relying on the latter in our conclusions very much, because we have repeatedly noticed optimizations of hard disks for this test package). 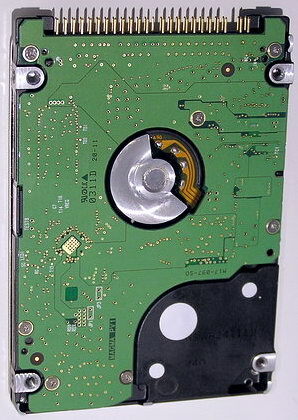 The hard disk from Samsung demonstrates variable speed of linear reading — in compliance with the "elastic writing density" technology, which had been previously used in desktop hard disks from this company. Taking into account that Hitachi also uses a similar technology, in this review only Seagate Momentus demonstrates a smooth graph. It's clear that the new hard disk from Samsung is noticeably inferior by this parameter to its competitors manufactured 0.5-1 year ago. The loss to the leader — Hitachi Travelstar 5K80 — is 7% on average and reaches 12% on the fastest tracks at the outer edge of the media. By the way, Hitachi 5K80 also outscored the Momentus disk, and it outscored its 4200rpm counterpart with the platters of the same density by 25% — i.e. less than the spindle speed gain (i.e. the bit density on the platter was reduced in the Hitachi 5400rpm disk). IBM/Hitachi hard disks are naturally and traditionally the leaders by the UltraATA/100 transfer rate, and unfortunately Samsung and Seagate are a little (~10%) short of speed to reach maximum capacities of this protocol. However, with the large cache size and the real read/write speed of the platters being minimum twice as slow as the interface speed, this shortage will hardly have its effect on the overall performance of these hard disks in real applications. 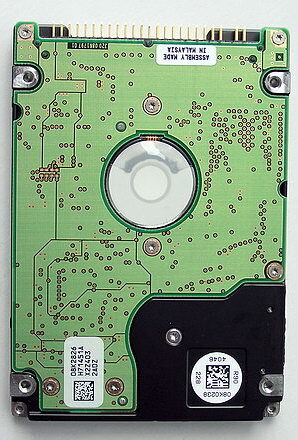 The hard disk from Seagate is leading by the average access time, as was expected from the specification. And Samsung Magma "seeks" almost on the par with Hitachi 5K80. By the way, if you subtract the average latency from the access time, then the average seek time in the old 4200rpm IBM 80GN is even a tad (by 0.2-0.3 ms) better than in the up-to-date 5400 rpm 5K80. Comparison of the average access time taken separately for reading and writing provides more food for thought. In this case we provide results of the H2benchW test, though similar data can be obtained in other programs (for example, Iometer). For example, you can evaluate the efficiency of lazy writing and caching written data in the disk buffer by how smaller the average write access time is. Momentus is in the bottom of the list here, and Samsung has almost caught up with the leaders — both Hitachi hard disks. 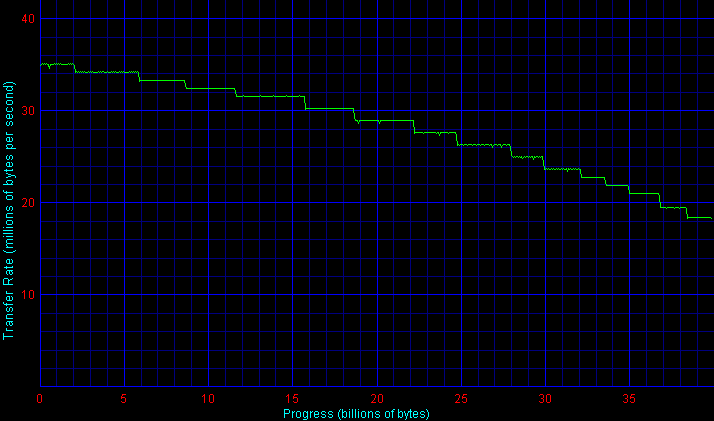 ATTO Disk Benchmark results for Samsung SpinPoint MP0402H. ATTO Disk Benchmark results for Seagate Momentus ST94811A. ATTO Disk Benchmark results for Hitachi Travelstar 5K80. ATTO Disk Benchmark results for Hitachi Travelstar 80GN. According to the results of this test, Samsung MP0402H has an excellent firmware optimization to deal with small block sizes — the transfer rate on 512, 1024 and 2048 byte blocks for this hard disk is the highest among the contenders. And it reaches the maximum read/write transfer rate starting already from 4 KB blocks, while the other disks — only from 8 KB. But for all that, MP0402H features an even read/write graph (4-1024 KB), without dips, which is unfortunately not the case with Hitachi Seagate. But the Samsung hard disk is not that effective with caching files of 1 MB and larger than Seagate and Hitachi. While Momentus is excellent at caching even 1 and 4 MB files for lazy write (according to the test results, its speed is actually equal to that of the ATA interface) and Hitachi caches well 1 MB files both for reading and writing (and 4 MB — for reading! ), the Samsung hard disk actually operates at the speed of a physical data medium with 1 and 4 MB files — even worse than Travelstar 80GN with the buffer four times as small, which at least steadily caches 1 MB files for reading. 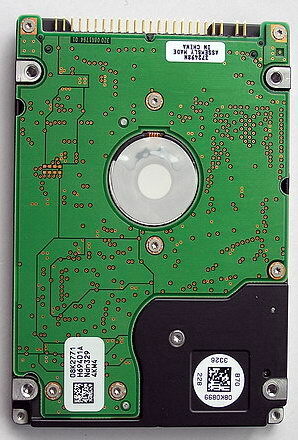 Now let's see how the pros and cons of the interior hard disk design noted above reveal themselves in applications. At first, let's find out whether the hard disks are well optimized for multithreaded operations. For this purpose I traditionally use NBench 2.4 tests, where 100 MB files are written to disk and read from it in several simultaneous threads (in this case we use FAT32, though the test results on NTFS will be practically the same). This diagram lets us evaluate the efficiency of lazy write procedures in the hard disks in real (not synthetic, as on the diagram with the average access time) conditions when the operating system works with files (no Windows caching here). You can see that the 5400rpm Hitachi model is perfect at lazy write — even with four simultaneous threads being written on the platter close to each other, the write speed slumps very little relative to the maximum speed — only by 20%. Even with simultaneous writing to remote sectors of the hard disk (half of the threads – to the outer edge of the media, the other half – to the middle) the multithreaded transfer rate drop is less than 35%! Neither the old IBM 80GN with its small buffer (37% and 52% correspondingly) nor Momentus (it disgraced itself here having lost over three thirds of its speed, though it had excellent lazy write in ATTO Disk Benchmark) can boast of such achievements. But Samsung M40 turned out not bad at all – the transfer rate losses are only 24% and 28% respectively. That is it outscored even Hitachi 5K80 in spaced write threads, though the low linear speed does not let it become the absolute winner (by the average results of multithreaded writing). The situation changes noticeably with multithreaded reading. Anticipatory reading is considerably worse in IBM/Hitachi hard disks (at least judging from this test – in ATTO Disk Benchmark they on the contrary featured noticeably advantage in this category). Samsung and Seagate hard disks are leading with a noticeably breakaway from the other disks. Now let's see how these hard disks fair in the ancient but still popular Disk WinMark test from the famous WinBench 99 package. Remember that we carry out these tests not only "for the beginning" but also for "the center" (by capacity) of the storage medium for both file systems. In office performance (where disk caching sometimes plays an important role) the new hard disk from Samsung confidently outscores its competitors even with faster read/write and seek speeds. It's identically successful on both file systems – FAT32 and NTFS. Something tells me that the Korean engineers had a lot of sweat go into the microprogram optimization of their disks to these benchmarks, because no other test applications demonstrate this "overwhelming" advantage of SpinPoint M40... The other disks are rated approximately according to their "physical" characteristics. However, High-End Disk WinMark 99 test are more adequate. The 5400rpm Hitachi model is an obvious leader while Momentus and Magma are fighting for the silver medal with varying success – Seagate is a tad faster on FAT32 , on NTFS – Samsung. Frankly speaking, I do not trust those WinBench tests – hard disk and controller manufacturers are too tempted to optimize their microprograms to obtain better performance in these popular and marketing-significant benchmarks from Ziff Davis/PC Magazine. So I provide these results only for the record, but I don't recommend to take them into account in your conclusions. A little less "hackneyed" are the complex performance tests in typical applications – PCMakr04 and C'T H2BenchW. They both "play back" prerecorded hard disk activity tracks in corresponding applications and measure the completion speed of each track, and then they average the results. The disk test in popular Futuremark PCMark04 is often used by common users for express-evaluation, though it's not free from shortcomings. We provide its results not for the sake of an objective picture but to let our readers get their bearings on their own results. As you can see, the ordinance of hard disks in this test is similar to the results of the linear read speed test. Similar H2benchW "track" test, which is favored by german colleagues from the C'T magazine and Tom's Hardware Guide web site, gave somewhat different results – Hitachi Travelstar 5K80 is in the lead with a great breakaway, and Samsung M40 again outscored Momentus and got the silver. Another quite independent measure of disk performance in applications can be the speed of Adobe Photoshop working with the temp file. In this case I'll provide the results of only one of my tests in Photoshop – resampling a huge image, which is carried out almost completely in the swap file of this program (RAM usage is limited to minimum). The results are quite appropriate – Hitachi 5K80 is again beyond comparison, and the success of Seagate Momentus can be explained by its small seek time, because in the process of this test the hard disk is actively "churring" with its heads. 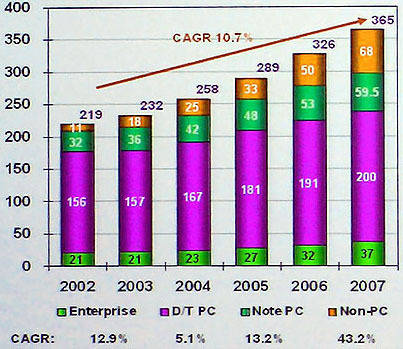 Samsung rolled down almost to the level of the last year IBM with 4200 rpm and 2 MB buffer. We also use special patterns in Intel IOmeter to imitate hard disks operating in various applications. As you can see, Seagate Momentus is the obvious leader in all four "server" patterns (let's refer the workstation to them as well ;)) – small access time is probably very important here. Silver (sometime even gold – with large queue depth) is won by Hitachi 5K80, Samsung is always the third. However, these tests are rather supplementary, because no one will put SpinPoint M40 into blade servers. But Seagate Momentus or Hitachi 5K80 – why not? In the imitation of reading and writing large files (like mp3, video, large photos, etc) Hitachi 5K80 is beyond comparison (though Seagate is leading in reading), but Samsung Magma is outscored even by the last year 4200rpm IBM 80GN. It seriously lags behind – especially in writing (remember ATTO test results)! On the contrary, Seagate Momentus wins in the imitation of reading and writing small files (due to reading, because Hitachi 5K80 is again the winner in writing). And Samsung Magma is on the third place, though its lag is very little. Hitachi hard disks are obviously better than their competitors in the imitation of disk defragmentation on NTFS, while on FAT32 Seagate is faster and Samsung is not bad at all. On the average, Magma is an outsider in this test. In the imitation of copying large and small files, IBM/Hitachi hard disks are excellent at large files and are outscored by Seagate and Samsung on small files. On the average, Samsung Magma is again an outsider – just because of its failure with large files as in the pattern for reading/writing a large file. At last, the pattern of streaming read/write with large or small blocks, which imitates, for example, a digital audio recorder with lazy write, outputs the results similar to copying files. Though Hitachi is the winner here, and the other participants are heavily defeated! The reason for this is obviously in the firmware optimization for such tasks (especially in case of 4 KB blocks), but not in simple physical characteristics of the hard disks. However, to be fair I should note that such tasks are more often performed in large blocks. So the results for 4 KB blocks are only of academic interest and it just confirms the overall conceptual advantage of IBM/Hitachi firmware. Power consumption of the hard disks in various modes is one of the most important characteristics for notebook hard disks. These days the economical efficiency of hard disks simply cannot be ignored with this "mass" power saving movement for all notebook components, launch of "under-three-watt" monitors, and the universal "eight-hour-batteries" program. As we have seen before (see the table in the beginning of the article), according to their specification Samsung SpinPoint M40 hard disks are at least no less economical than their main competitors. That's "on paper", but we are to find out what's going on in practice. It goes without saying that to use life time tests of the whole notebook (for example in MobileMark or BatteryMark programs) in order to evaluate the economical efficiency of hard disks would be far from rational and illustrative. There are a lot of different notebooks with the total consumption from 5-7 to 35-40 W (sometimes even higher). So that tiny economy of the whole notebook life time (it will be minutes against several operational hours, as a rule) due to a "colder" hard disk measured on one of the notebooks is not at all bound to be the same (or even comparable percentage wise) for a different notebook. 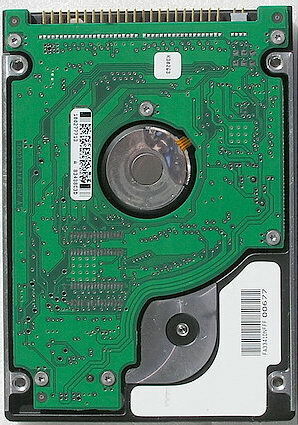 And it's hardly possible to measure to three decimal places (which is necessary to filter the correct contribution of the hard disk) the overall "heat package" even for a certain notebook sample without plant conditions, especially if you take into account that in reality many notebooks use different adaptive power saving techniques. That's why I did a simpler, more illustrative, and more reliable thing – I directly measured typical currents (and wattage) of disk consumptions in various modes: when idle (rotation only), reading, writing, active seeking, ATA interface operation, at power up, etc. To my mind, it's these parameters in complex that reflect the most complete picture of disk heating (a product of current by supply voltage (5 V) directly makes the thermal power dissipated by a hard disk, while taking the hard disk temperatures inside a given notebook would have provided little information) as well as of its economical efficiency as part of a given notebook with a "heat package" you approximately know. Compared with power consumption of each notebook in different modes, it will facilitate the appropriate calculations. Average current drains of the hard disks in main modes are given in the table below (ammeter with the 0.1 Ohm internal resistance was connected to the +5 V supply circuit). Several modes need explanations. Idle – the disk is just rotating (no data access). Pre-idle – it's an active mode lasting 2-3 seconds after the data access is completed and before the hard disk switches to idle mode (the heads are not yet parked to the edge of the platter). ATA Transfer – it's a data transfer mode via the ATA bus without accessing the platter itself. Seek – active search (chaotic movements of the heads along the entire platter). Start – maximum current at startup (averaged value with the time constant of about 0.1 sec). Results for reading and writing are given for the current drain range – the first figure corresponds to the beginning (outer tracks) of the disk, the last – to the inner edge of the disk. All modes, except for the Start mode, were measured during the corresponding stages of HD Tach 2.61 (just this version, not higher ones) and AIDA32 Disk Benchmark tests (AIDA32 test results are given in brackets, if they do not match those for HD Tach 2.61). Table 2. 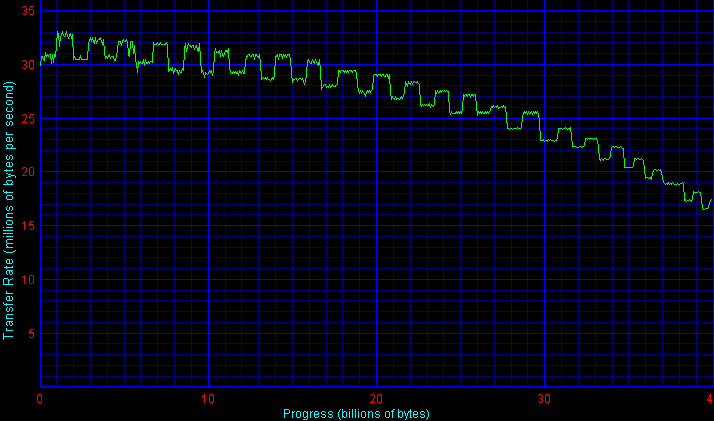 Current drain (mA) in hard disks powered by a +5V supply, measured in various modes. Analysis of this table revealed several interesting moments. Power consumption of the Samsung Magma hard disk in idle mode (that's the mode in which hard disks operate in notebooks most of the time) is better than in many 2.5-inch 5400rpm models (except for Hitachi 5K80), but it's worse than in 4200rpm models. However the Samsung hard disk turned out the most economically efficient in reading/writing/seeking, also outscoring competing models slower in spindle rotational speed. Unfortunately, maximum startup current in MP 0402 H cannot be called low, which can sometimes prevent this disk from starting up, when used as an external storage device powered from USB port (without additional power supply – for example in old mainboards or PCI controllers). where the current is in amperes. The following diagram is plotted according to the calculated power consumption data. Average power consumption of mobile hard disks for typical user operations and for intensive (constant) operations with the hard disk. Samsung SpinPoint M40 turned out the most economically efficient drive in the mode of constant (active) operations with the disk, having considerably outscored the competing hard disks with 5400 as well as 4200rpm! It owes the success to the low current drain in reading and writing. At the same time, with typical notebook operations (when the hard disk is accessed episodically) power consumption of SpinPoint M40 raises almost to the level of the other 5400rpm models (because of the high current drain in idle mode), though the disk remains the best in its class so far, outscoring its counterparts from Hitachi, Seagate and Toshiba (however, this review does not include 5400rpm Fujitsu models, which could have shattered Samsung positions). We have a comparative listen of Samsung and Hitachi hard disks for subjective evaluation of their acoustic characteristics. 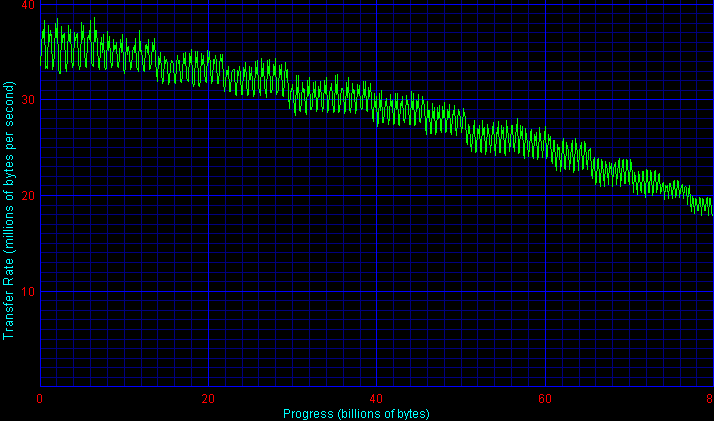 We made out two distinctive components in the noises produced by the hard disks in idle mode (no seek). Each hard disk was evaluated by every component separately. The two components are the high-frequency "clanging" (of bearing and other hard disk components) and the low-frequency "rumbling" (vibrations, which characterize spindle and platter balancing). 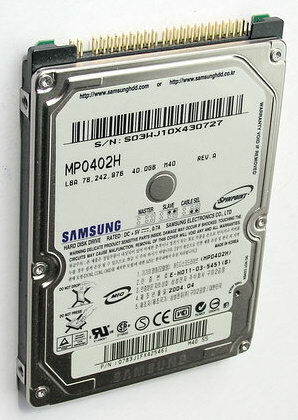 Samsung hard disk turned out the quietest in "clanging", followed by Hitachi hard disks in the increasing order of their rotational speed – 4200, 5400 and 7200rpm. Hitachi 4200 and 7200 rpm samples tested in our lab turned out the quietest by the low-frequency "rumbling". Samsung and Hitachi 5400 rpm models appeared noisier ("rumblier" :) ). All the hard disks tested in this review (except for Momentus) supported the seek acoustics control via a special register. However the seek acoustics control was disabled by default in these hard disks (disabled, the register value equals 255dec). So we tested their performance in this mode, though our express-evaluation showed no significant difference between their performance in "slow" and "fast" seek modes. For example, the average access time of the Hitachi HTS 546060 M 9 AT 00 in "quiet" seek mode (128dec in the register) increased from 17 ms only to 18 ms. What concerns the seek noise, it was almost identically quiet in Magma and the 4200rpm Hitachi hard disk, and a tad louder in the 5400rpm Hitachi model. On the whole, the seek noise is almost inaudible against the rotational noise in the majority of up-to-date mobile hard disks. We all know the proverb about the "spoil and spin". However this is not the case with Samsung Magma. This hard disk turned out rather good for its market segment. 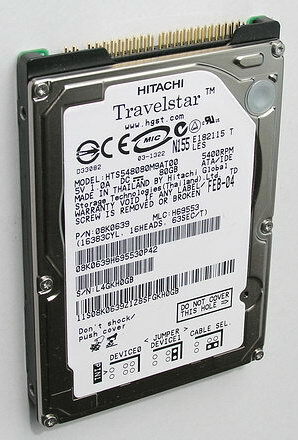 It goes without saying that in performance it is outscored by Seagate Momentus (by read/write transfer rates, access time, and firmware optimization) and even more by the excellent Hitachi Travelstar 5K80, being perhaps the most successful mobile 5400 rpm model with 40 GB platters. However, a hard disk in a notebook, player, or a portable storage device is not required to provide high transfer rates. Reliability, shock resistance, power consumption, and lack of operational noise are more important. And by these parameters the hard disk from Samsung is quite decent. And it is not that inferior in performance to the leaders (sometimes it even outscores them). If Magma is a tad cheaper than its competitors, has three-year warranty and is available on the shelves, it will surely "suffer" the market success among mainstream users. And to demanding users we can advise Hitachi Travelstar 5K80 and the mobile 7200 rpm Hitachi 7K60, which will be reviewed in the next article.